I’ve always been a little afraid of cactus plants. Though inclined to like any vegetation that looks like an alien life form, the very idea of a cactus sends tiny invisible splinters to my fingers. In reality, it’s the cactus that should fear me, since I managed to kill one in college with the reasoning that if it could just survive in the dessert, it would flourish with regular watering. It did not. While I’d vaguely heard of cactus salad and stuffed nopales, I didn’t grow up in the southwest and it wasn’t till visiting Mexico last year, where they were piled high in the markets, that I really thought of them as an everyday vegetable to try. Assuming I would have to wait for my next trip or plan a weekend excursion to Brooklyn’s Sunset Park, I was at Essex Market on the Lower East Side when I saw them in a produce case – firm, bright, and as perfectly ordinary as a pile of green beans. I brought them home. 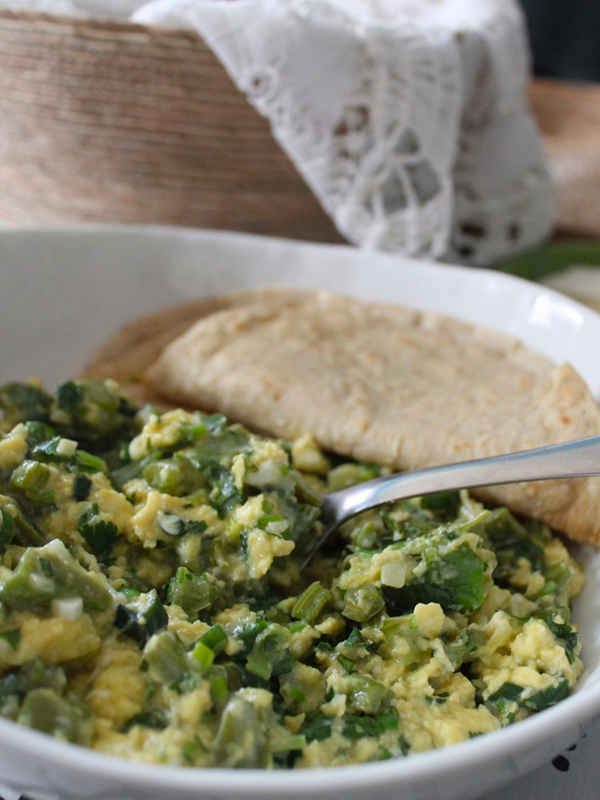 Consulting Diana Kennedy’s My Mexico first, I decided to make them simply with scrambled eggs and corn tortillas. Cutting carefully around the edge then scraping off the nodes and protruding spines with a knife or peeler, I assumed that my New York cactus paddles were domesticated and skipped the gloves. It only took few pin-pricks to remind me what I was dealing with and the gloves came on. After a few quick searches, I decided to scrub the paddles first with the rough side of a clean sponge to wipe away the needles then give them a quick scrape to remove some of the thicker nods. Most recipes called for simmering or steaming the nopales beforehand but I wanted to them have some snap so I quickly sautéed them instead. Because I like my eggs on the runny, creamy side, I cooked them slowly and took them off the heat early. 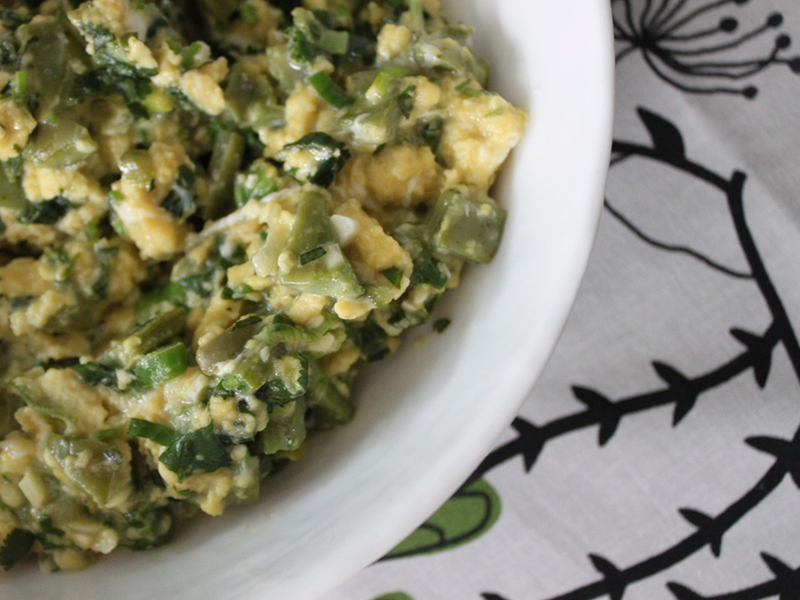 Adding the cilantro a little bit at a time, I thought it would overwhelm the scallions and nopales but it was perfect – the acidic nopales adding just the right element of something different. With winter finally here and the leaves long gone, there couldn’t be enough green – exactly what I needed. Adapted from recipe by Sra. Antonia Hernández de Gutiérrez in Diana Kennedy’s My Mexico. Most recipes called for simmering or steaming the nopales beforehand to cut down on the okra-like mucilage the vegetable releases. Finding some later versions where they were added raw, I decided to skip this step and after a few minutes it had largely cooked away. In a large saucepan, heat oil over medium heat. Add scallions and garlic and sauté for 1 minute. Add diced nopales and oregano. 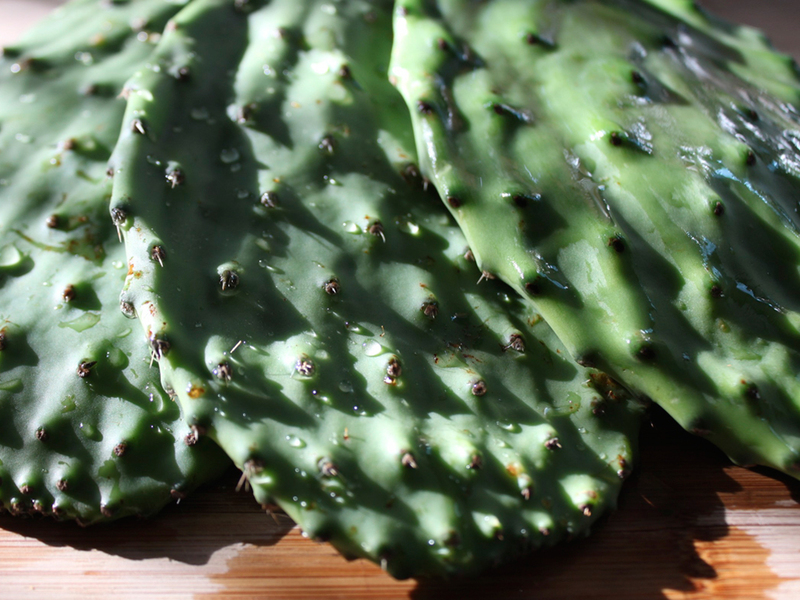 The nopales will release a mucilagenous fluid, continue to sauté until most of liquid has evaporated, an additional 3-4 minutes. Add the beaten eggs then immediately take heat down to lowest setting. Stir the eggs until the curds form to desired degree of doneness. 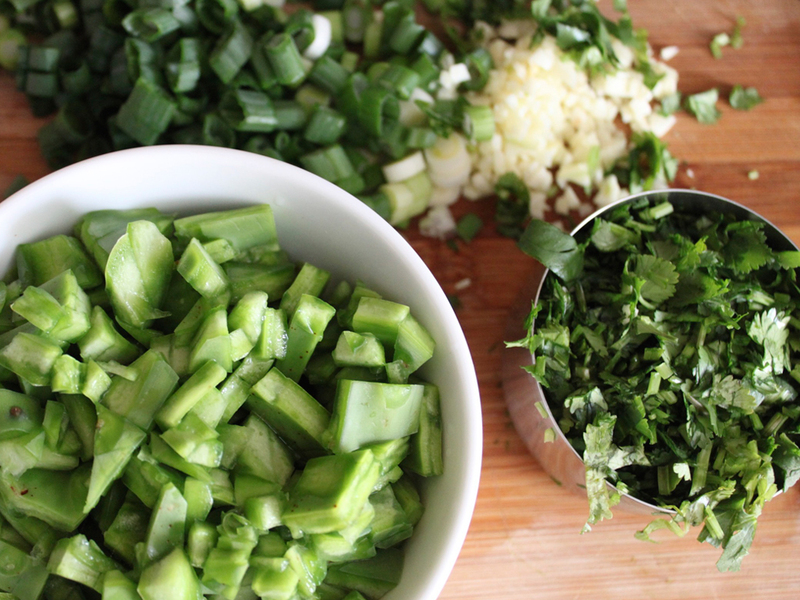 Stir in the cilantro and remove from heat. Serve with warm corn tortillas and slices of queso fresco. Ana, I brought some packaged nopales from Mexico and I can’t wait to try this. It sounds like we are going to have a delicious breakfast this coming Saturday!!!!!! I hope that’s an invitation because we’ll be there this Saturday! hmm, que rico. just like my Mom´s!. (although she uses cooked nopales). Although I have never had cactus, this dish looks like a must try. Thanks so much for sharing. 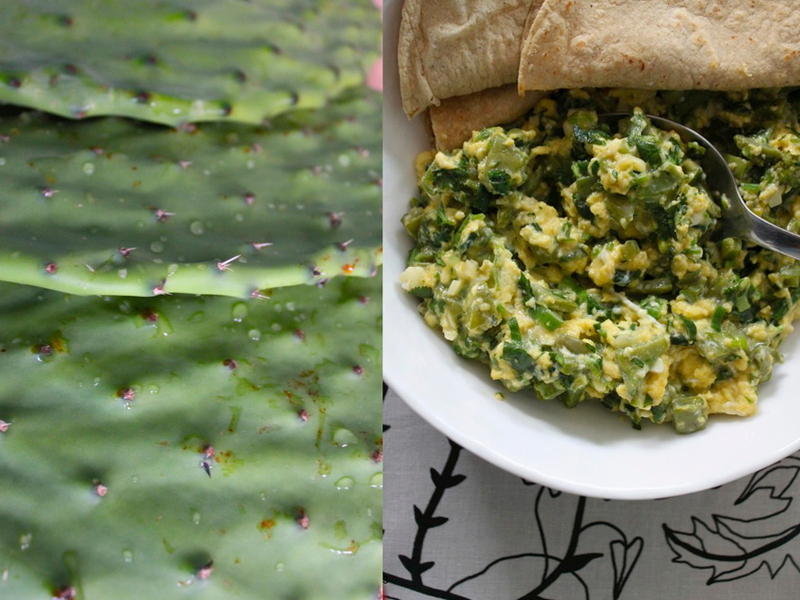 There is actually a recipe post that I am preparing as we speak for Huevos con Nopales y Cilantro/Eggs with Cactus Pieces and Cilantro. I hope mine looks as good as yours once Im done! I would like to share Fresco Tortillas for this dish.. Wonderful recipe and blog. I am an ex-Brooklynite who recently moved to Belgium. Love reading your stories. Thank you.